From the author who brought us Blossom Possum comes an attractive addition for the shelves of books depicting our awesome Australian animals, this time an attractive and informative non-fiction book published by the National Library of Australia. Marine biologist and zoologist, Dr Gina Newton, has drawn both on her own knowledge and the research and expertise of others, including the resources of the National Library, to create a visually appealing and well-designed book brimming with fascinating facts and fabulous photos. The design is exceptional, being divided into seven habitats featuring 120 iconic animals from fifty selected national parks across Australia. Descriptions of the habitats commence each chapter and are supported by images of the included national parks within the habitat type. Next are details regarding the animals, including distribution, conversation status, interesting facts and striking images. The diversity of wildlife is clear as the animals have been chosen from the range of taxonomic groups. Accessibility of information is well supported by a variety of colour-coded keys, diagrams, maps, break-out boxes and thorough indexing. The endpapers also provide a national park map which is useful for the reader. An error has been carefully camouflaged in the copy I have received by a sticky piece; it may prove tempting to the young reader to explore what lies beneath. 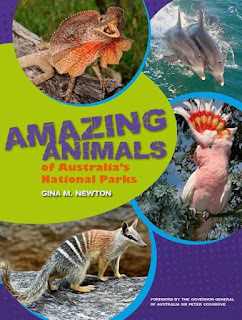 Amazing Animals of Australia’s National Parks is an excellent choice for young wildlife enthusiasts in the mid to upper Primary years and a useful addition to the school library with teacher notes also being available on the NLA website.